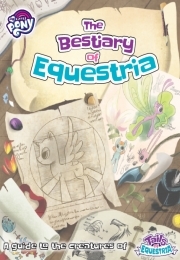 Now available as a digital download from our good friends at Riverhorse is the My Little Pony: Tails of Equestria – The Bestiary of Equestria! A simple to play, yet very fun for all game, Tails of Equestria just got much bigger with this new release, available from Riverhorse directly or for DrivethroughRPG Now! Within the book lies a wealth of information about the fantastical creatures and characters of Equestria! For use with Tails of Equestria: The Storytelling Game, this bestiary will help you tell fantastic adventure stories and fill the world with all sorts of beasts and monsters. Every adventure needs characters, and this book will help you out whether you are a player or a GM. There are dozens of new creatures from all over Equestria, and even some from beneath and above it! Some of these creatures are beastly, some are unique characters, and some are races that players may want to pick when creating their character. Curious and cunning Diamond Dogs. From adorable to terrifying, the bestiary contains details and stats for all sorts of creatures. This will add a huge amount of depth and variety to the types of encounters the players will face. As well as monsters, you’ll find details on the friendly, familiar faces of Friendship is Magic. From Big Mac to DJ Pon-3, Scootaloo to Flurry Heart, and many more! Lots of new creatures means plenty of new powers, magic, and special abilities. The unique and often dangerous creatures of Equestria are equipped with many Talents and Quirks, which are detailed in the bestiary. Some of these new Talents can even be gained by Pony Characters when they level up!